Welcome to OTW Safety! We design, engineer, and manufacture the highest-quality safety barricades on the market. We offer plastic barricade solutions for airports, roadways, crowd control, and security. Suited for various safety and security uses, each of our safety barriers is designed to offer protection, longevity, and ease of use. As the original manufacturer we’re able to offer competitive pricing directly to our customers. Quotes are easy! Call or submit a request online and you’ll receive a quote including estimated freight charges within one business day. Since 1993 our talented engineers have been dreaming up alternatives to concrete and steel barriers and working with customers along the way to refine and perfect each design. We support multiple industries with our unique product lines and make it a priority to stay informed on the changing needs of our customers. Ensure that you are using the highest quality and most innovative products – buy directly from the manufacturer. When it comes to work zone safety concrete is not the only option. Our 42″ Jersey Shape LCD is the only plastic barricade approved for use in high speed zones. Check out the most innovative crowd control barrier on the market. With an integrated display panel and feet that swivel closed, this barricade will change how you do crowd control. Have you ever wished for an alternative to the metal eyesores that surround many venues and events? The Billboard Barricade not only looks better, it works better too. Buy direct from OTW! We design, engineer, and manufacture all of our safety barricades in the United States. Since 1999 we’ve been producing the highest quality airport barricades and our products are trusted by major airports across the globe. We are a small business focused on relationships. We spend time with our customers working to understand their needs and offering them tailored solutions. We provide expertise in site safety, planning, and management with a team that has the knowledge and experience to help customers meet their requirements. Our focus on relationships extends to our manufacturing and shipping partners. These long-term partnerships allow us to guarantee quality and efficiency throughout all our processes, keep costs low and pass the savings on to our customers. Compared to larger barricade suppliers we have much more flexibility and can usually offer lower prices and faster delivery. Give us a call! We’d love to help. We’re available Monday through Friday from 8am to 5pm. Our plastic safety barricades create order in public spaces and prevent accidents and injuries. We work diligently to ensure safety by supplying superior products and making sure our customers employ the correct barricades for their specific needs. 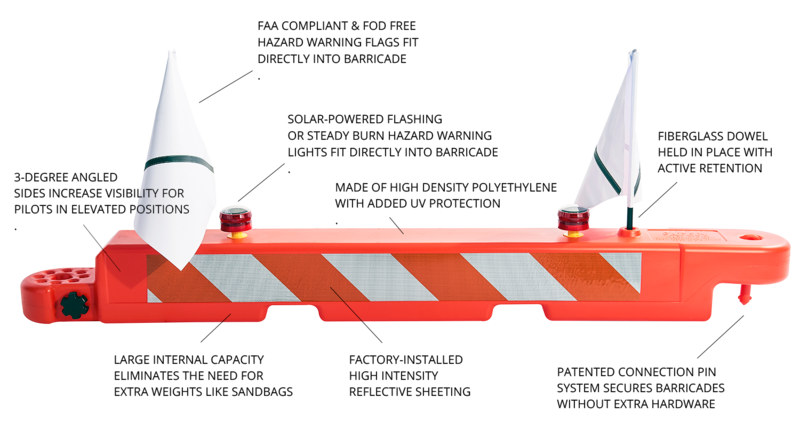 Our construction barricades are trusted by major airports and roadway construction contractors alike. Our crowd control barriers are in use at a ton of venues including sports stadiums, concert halls, zoos, and outdoor festivals. Our heavy duty security barriers are relied upon by various branches of the military and play an integral role in protecting important buildings, checkpoints and military personnel. Uniquely suited for various safety and security uses, each of our barricades is designed to offer protection, longevity and ease of use. We take pride in the design and construction of each barrier we sell. We’re proud to say that all of our plastic barricades are made in the USA and are 100% recyclable. Our barricades are composed of superior grades of plastic known for strength and durability. They are also UV-resistant, have high impact and melt strength, and resist stress cracks and fracturing. This means our plastic barriers stand up to weather and transport. High Density Polyethylene can be recycled into things like plastic lumber, tables, roadside curbs, benches, truck cargo liners, trash bins, and other durable goods. We employ advanced molding techniques to create plastic barricades that are lightweight and easy to move when empty, but which are exponentially heavier once ballasted with water or sand. Once filled, most of our plastic safety barriers become up to 10x heavier and nearly immovable. We offer a one-year manufacturing warranty and all of our products are designed to last a minimum of eight years. We work closely with the factories that produce our barricades so you end up with reliable barricades every time you order! OTW was built on the idea that great products not only meet needs but also serve the community at large. We’re based in Salt Lake City and our founder Marc Christensen was a firm believer in supporting the work of non-profits in the city. We’ve donated safety barricades to a wide range of groups. When it comes to our crowd control plastic barricades, non-profits not only receive the value that barricades can provide, they also gain an advertising platform to showcase their sponsors and attract more donations.